As you probably know by now, Lara and Holly both have very sensitive skin which dries easily so we try to be careful with which products we use on their skin at bathtimes. 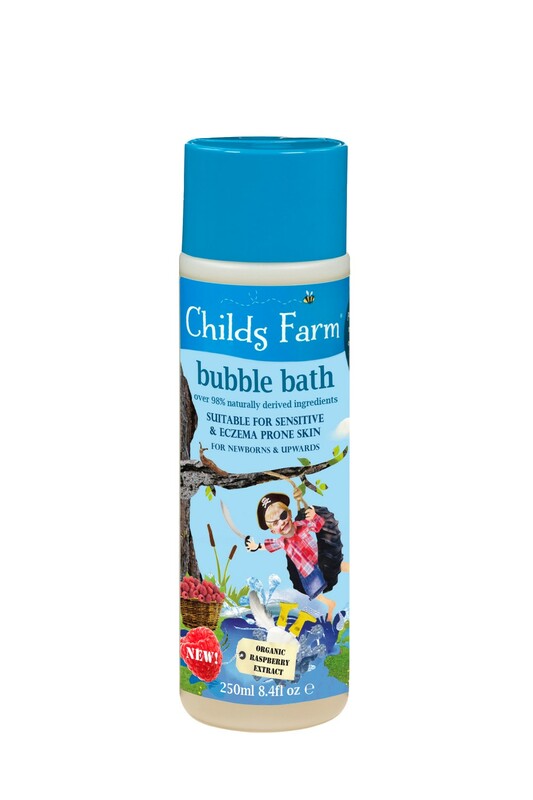 One of our favourite brands, Childs Farm, has just launched a new raspberry-scented Bubble Bath for Bucaneers which is specifically designed for children with sensitive or eczema-prone skin. Childs Farm 3-in-1 Swim Shampoo has become one of our family staples, due in part to its strong, yet natural scent that the girls both find fun. This Bubble Bath for Bucaneers is no different; the strong raspberry scent comes from raspberry extract and it very much reminds me of our recent visit to the pick-your-own farm in which Holly devoured her own weight in raspberries! The smell is definitely one that the girls will remember and remind them of bathtimes as they grow older and yet you can feel comfortable knowing that the bubble bath isn't packed full of artificial ingredients which could wreak havoc on their skin. The girls love the smell, and the bubbles - it just goes to show that a bubble bath doesn't need to be brightly coloured to get the kids interested in it! Its gentle on the skin and a fun way to finish the day, getting out of the bath smelling summery and fresh. Childs Farm bubble bath is available from John Lewis, Ocado and Boots. Look out for other fun products in their range including hair detangler, hand and body lotion, hand wash, conditioner and hair & body wash.